Say the phrase ‘box set’ and you’ll immediately grab anybody’s interest. It may be a brightly coloured flimsy bit of cardboard clasping your CDs or DVDs together, but somehow in the eye of the beholder, that simply makes it immeasurably more complete and aesthetically pleasing. 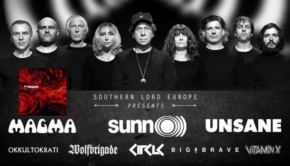 I am absolutely a sucker for this kind of advertising, and with Magma’s 12CD live omnibus Köhnzert Zünd, nothing was any different. For me, Magma has always been the occasional treat, a once a year present to myself. I’d like to say that this is because I’m good at exercising self-restraint and know that it’s better to enjoy things over a long period of time, but it’s closer to the truth to say that the CDs were never at a great price on Amazon. My first Magma purchase was one of their most highly rated albums, Mëkanïk Dëstruktïẁ Kömmandöh, back in 2010. I’ll admit, it did take me a bit longer than expected to really ‘get it’, but get it I did, and I’ve been a Magma Köhnvert ever since. That said the limited exposure I’ve had of their music has meant I’ve never been an expert on the band. 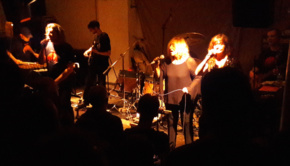 This year, Magma played four nights in London at Cafe OTO in Dalston, a very close and personal setting where you could quite literally be inches away from the band. I didn’t know it at the time, but they started the set with Theusz Hamtaahk, a hypnotic 40-minute suite that blew the roof off. They followed this with the more familiar and truly excellent Mëkanïk Dëstruktïẁ Kömmandöh nearly in full. I’ve read online before that “Live Magma is the best Magma” but you can’t quite appreciate the meaning of that until they provide you with a near out-of-body experience in a tiny hipster venue in North East London. As with any good band, the merch was plentiful by the entrance. On top of the myriad CDs, records and shirts on offer, a prize loomed. Like a trophy, the crimson and black Köhnzert Zünd box-set appears without companion. Whilst I was still at the venue, it did not disappear, most punters deeming themselves not worthy of (or perhaps just not in pocket for) its treasures. Nevertheless, with its aesthetic design, combining a large cylindrical Magma logo with a square base listing the contents, the package was a lot more magnificent than I had imagined. I didn’t purchase on the night; one has to root around for a deal in these convenient days of Internet shopping. The price had been £80 at the venue – arguably a good deal when the music itself is beyond brilliant – but I managed to see prices as low as £42 online (frustratingly after I purchased it at £52). One has to bear in mind, this is a 12CD box set with over 9 hours of material that is truly not of this earth. The value is phenomenal, whatever price you happen to find it at. 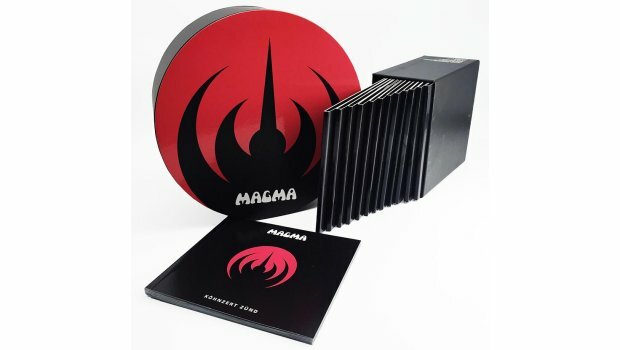 The 12 CDs, which supposedly comprise all of Magma’s official live releases to date, are individually packaged in cardboard sleeves that may or may not use aspects of the original sleeve, but always feature the Magma logo in the same triangular fashion. The notes are painfully limited, only consisting of a brief introduction in French and English by Christian Vander himself. Then again, Magma were always fairly mysterious, the burden being on the listener to piece together as much information as possible. The rest of the 80-page colour book consists of a plethora of photographs and news clippings in French and English from throughout the band’s career. Then there’s the music itself. If you’re a newbie to Magma, turn back now, as the band pull no punches. The set starts off with Live/Hhaï, first released in 1975; after a shout, we’re dropped straight into a full blistering rendition of Köhntarkösz, their album from the previous year. At 31 minutes, this isn’t even near the longest tracks to be discovered on this set. 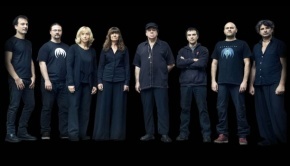 It seems that live, as on their albums, Magma prefer to go long form, providing marathon length hypnotic rhythms for audiences to be mesmerised by. On the second disc, we hear the first edition of Hhaï, later to be absorbed into Ëmëhntëhtt-Ré, as is evidenced on disc 11 of this set. This is the first of several pieces that reappear throughout the Zünd, undergoing evolutions at each stage. The second comes on the same disc; extended from the original LP, the second half of Mëkanïk Dëstruktïẁ Kömmandöh is presented live in 1975, as close to the original material as it gets, replete with a phenomenal violinist. The track Mëkanïk Zaïn is one of the best in the set, a blisteringly fast 7/8 jam followed by the classic finale. The three-disc Retrospektïẁ, originally released in 1980, is next and features the non-studio 36-minute track Theusz Hamtaahk, supposedly meaning “Time of Hatred”. A mostly hypnotic, repetitive track, it is nonetheless gripping in its earnestness. As a side note, it seems that the remaster in this Zünd has an audio drop out right at the beginning as Vander clicks the band in. It’s a shame that Seventh Records couldn’t fix this as the problem isn’t there in previous editions. When I asked if this problem was local to my CD, they assured me the drop out was on the original master. Following on, just two discs after its initial appearance, the full Mëkanïk Dëstruktïẁ Kömmandöh is presented once again in its grotesque brilliance. The final disc of the three presents some lesser-known but still quite enjoyable tracks. The Hhaï on this disc is easily the best. Afterwards, we’re confronted by the Theusz Hamtaahk Trilogie, recorded at the turn of the Millennium, and this is where the box set begins to feel like a slog, as we plough through another full Theusz Hamtaahk and a third Mëkanïk Dëstruktïẁ Kömmandöh, this time separated by the decidedly less forceful Ẁurdah Ïtah. The doubling of a specific track is understandable, but a whole album’s worth of material? Only Magma could get away with this. That being said, the specific version of Mëkanïk Dëstruktïẁ Kömmandöh in this set was my first ever brush with Magma live on YouTube, and I still remember being blown away by how different and yet more brilliant it was than the original. With an extended brass section, the sound is fuller, and Vander pulls out all the stops adding new facets to the music, such as a slowed-down then sped-up section that’s mind-bogglingly effective. Up next is the more recent and eclectic Triton Zünd Zëlëkt, featuring tracks as far back as the debut album. The standout for me is one of my personal favourites, Rïah Sahïltaahk, from the band’s second album, 1001° Centigrades, a track I’ve always longed to hear live. Also worth hearing is the eighteen minute, Šlag Tanz, darkly repetitious and haunting in its nature. Last but not least are some new recordings just produced for this set, from a 2009 concert in Paris. The afore-mentioned Ëmëhntëhtt-Ré is reproduced in full, allowing listeners to see how Hhaï is incorporated into the proceedings, and then the sumptuous half hour Felicité Thösz is played. Finally, the band close matters with the untypically soulful Sëhntëhndëh, that still contains many classic features of Magma’s music. Even though this box set can be a touch overbearing, the rewards cannot be overstated. Magma prove on every disc how far they can push the boundaries of music, and the audience roar after every performance. When you get a group of exceptional musicians playing brilliantly composed music, the setting seems irrelevant. While a simple recording pales in comparison to the real thing, this gleaming box set is about as close and thorough as you can get without a ticket.